From the car park, turn right onto the Reservoir road and cross the Norsworthy Bridge over the River Meavy. Follow the footpath immediately after the bridge, on your right, which takes you uphill through recently planted trees towards Leather Tor. Cross the stile at the top of this footpath and turn left onto the track which crosses the Devonport Leat. 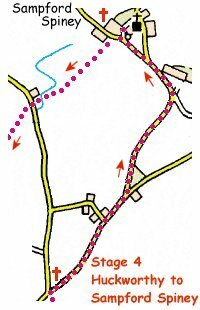 Follow the leat, by either bank, until you meet our first cross, Cross Gate Cross, at the junction with a narrow road which comes up from your left. Continue along the road in the same direction, with the fine view of the reservoir and dam, at the far end, in front of you and of Sheeps Tor across the water to your left. 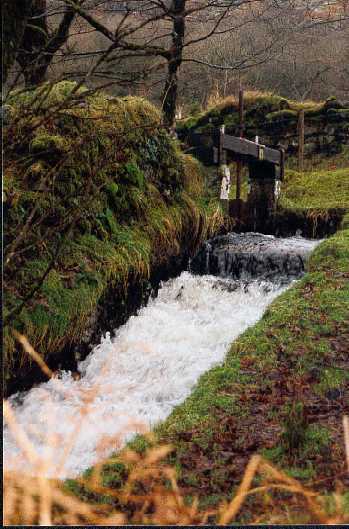 Look out for the sluice gate on the leat, which is shown in this photograph. 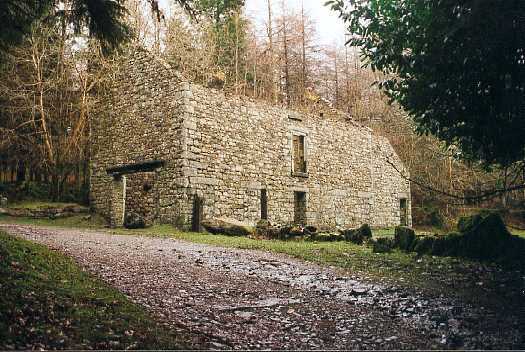 You will soon come across the remains of Lower Lowery Farm on a bend on your left hand side. Continue on the road and bear right at the junction, at the end of the trees. Just after passing over the cattle grid our next cross, Yennadon Cross, can be seen hidden in the undergrowth on the right hand side of the road, just before the junction with the B3212 Princetown to Yelverton road. Cross the main road and take the minor road, which is signposted ‘Unsuitable for Vehicles over 6 feet wide’. The church you now see in front of you is Walkhampton Church, which is about half a mile to the North East of the village. You will soon reach the hamlet of Welltown, which is the site of our next cross. 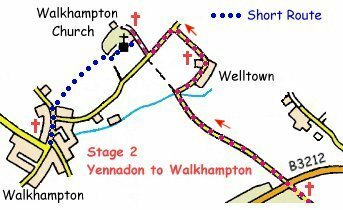 In actual fact it is only the shaft of a cross and is situated on the left hand side of the road, just around the bend after passing Welltown Farm. (Don’t be misled by the slender granite pillar (4 feet 9 inches tall and 9 inches wide) on the right hand side of the road on the approach to the hamlet. This appears to have been used as a gatepost at some time). 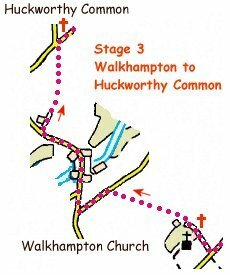 Continue up the road, turn left at the junction at the top of the hill and then take the footpath on the right marked to ‘Walkhampton Church & Huckworthy’. The Walkhampton Church House Cross will be found to the right of the track, immediately opposite the house. It is here where you must decide whether to continue with the full walk, or whether to take the short cut to Walkhampton. If you’re taking the short walk, retrace your steps and take the footpath across the front of the church and follow it around the side of the church and through a gate into a footpath which winds through the trees into a field. Descend through fields to the centre of Walkhampton Village. (Click here to continue the short walk). If following the full route, continue past the Church House and cross over the stile, just before the metal gate leading to the drive up to a private house. Walk down through the field, keeping the hedge to your left and cross over the stone stile in the corner. Cross the stile in the left hand corner of the next field and then follow the footpath as signposted. At the bottom, turn left onto the road, go right at the next road junction (signposted: Huckworthy Bridge ¼ mile). 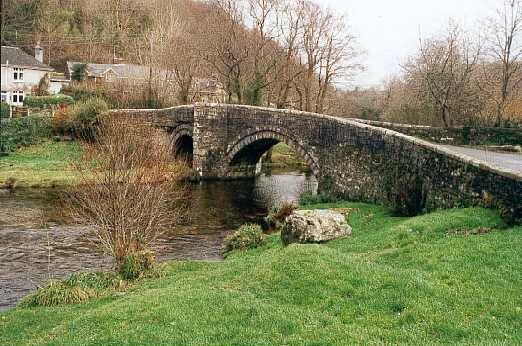 As can be seen from the photograph alongside, this is a picturesque hamlet, where the bridge spans the River Walkham in a quiet little valley. After crossing the bridge, walk up the hill and take the public bridleway signposted to your right. Walk up the path, pass through the gate and continue on the same path. This crosses Huckworthy Common and where the path meets the road we come across our next cross, Huckworthy Common Cross. At this junction, turn right and follow the sign marked: 'Woodtown and Sampford Spiney'. Continue on this road until you reach a fork in the road. This junction has a number of granite posts around a triangle of grass, against a background of deciduous trees – an ideal spot for a picnic. Bear left at this junction and keep left at the next one also. 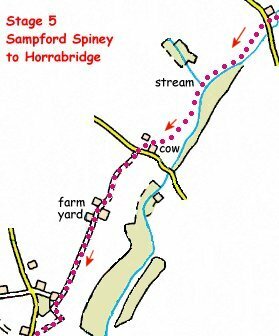 You are now entering the village of Sampford Spiney and the site of our next cross is on the village green – Sampford Spiney Cross. At the bottom of the green, cross the road and pass through a gate showing the sign: ‘Please Keep Dogs on Lead’. Go through the gates in the bottom left hand corner of this and the next fields and continue in the same direction via two stiles until reaching the road. Cross the road and go through the gate, slightly to your right and follow the direction of the footpath sign around the side of the hill. After crossing a stile beside a granite gatepost, the path continues straight on down the slope and over the stile, as indicated by the footpath sign. Cross the stream and follow the path until it reaches the road, by way of a stile composed of a number of concrete steps protruding from the wall. (Look out for a life-size plastic cow through the hedge as you approach the road). Cross the road and pass through the gate into the lane. This will lead you through a farmyard and into an enclosed lane. When this lane opens up into a field, carry on in the same direction keeping the hedge to your right and pass through the gate at the end. 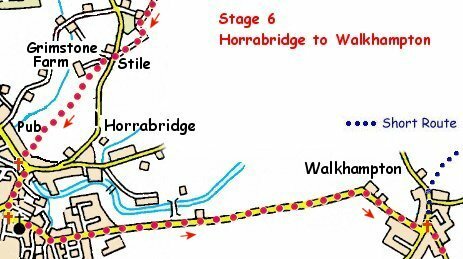 Follow the track through a gate into a field and pass to the left of the granite shed, just afterwards the track makes a right turn across the field and the village of Horrabridge now appears in front of you. At the end of the field go over the stile beside the gate into the road, turn left and immediately right into another lane, which is the entrance to Grimstone Farm. At the end of the hedge and before the start of the fence, go through the metal gate on the left and follow the sign marked: ‘Public Footpath to Horrabridge’. The path is well marked down the field, keeping the trees in the middle of the field to your left. After crossing the stile, continue in the same direction keeping close to the hedge and the path will bring you out into the centre of Horrabridge, beside the Leaping Salmon Public House. Turn left and then right onto the bridge over the River Walkham again. Our next cross is the Horrabridge Incised Cross and this will be found in the centre of the right hand parapet of the bridge. Carry on over the bridge and up the street past the London Inn. Turn left, just past the Methodist Church, into Station Road and our next cross can be seen on the corner of the Churchyard wall. This is the Horrabridge War Memorial Cross. Keep left at this junction and follow the road for about 2 kilometres to the village of Walkhampton. In the centre of the village, turn left and the Walkhampton War Memorial Cross will be seen in the centre of the next junction. This is also the point where the shorter walk rejoins this, the longer, walk. Turn right at this junction and follow the road to Dousland. On reaching Dousland, cross back over the B3212 main road and continue in the same direction. After passing the turning on your left to Sheepstor you will shortly see a sign for the village of Meavy. Turn right here and walk down to the centre of the village. The Meavy Village Cross is situated at the far end of the village green, beneath the Meavy Oak. There are three ancient crosses on the roof of the church and also of interest is a large cross cut in relief and set into the South transept gable, which is thought to have come from an ancient tomb. After leaving the church, walk back up the other side of the village green and turn right just after reaching the village school (signposted: Cadover). Note the replica of Drake's Drum displayed in the gable of the school roof. 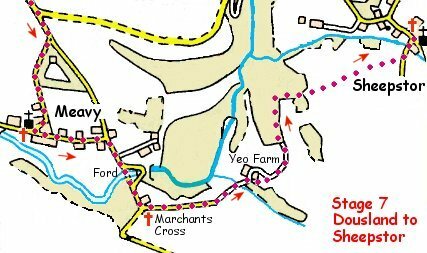 Cross over the River Meavy, either by Marchant’s Bridge or by using the stepping stones beside the ford. Just after passing over the cattle grid, Marchant’s Cross can be seen ahead, on the left hand side of the road. At the cross, turn left along the narrow road towards Yeo Farm. On reaching the farm, pass over the stile on your right, cross the footbridge and follow the track, with the wire fence on your left hand side. Turn left at the footpath sign, go over the stile and follow the track. On rejoining the lane, turn right and continue on. When a gate appears in front of you, keep to the path which goes around to the left. Before the end of the lane, cross over the tall stile on your left, turn right and follow the direction of the footpath sign through the trees. A series of yellow dots on the trees will mark the path, which eventually leads you around to the right and up to the top of the woods. At the top of the woods, go through a gap in the wall, over a stile, along the footpath and then over a granite stile in a wall. Follow the obvious path through the field, keeping the wall to your left. In the next field you get a good view of Sheepstor Church in front of you, with the massive bulk of Sheeps Tor immediately behind it. To your left can be seen the pointed mass of Leather Tor, with Sharpitor to its left and behind it and with a glimpse of Burrator Reservoir down below. Go through the gate with the yellow dot beside it at the end of the field, go right and through another gate with a yellow dot on the post. Cut down across this field to a point about 100 yards to the left of the far right hand corner. Go through the gap in the hedge, turn right and follow the lane until reaching the road. Turn left onto the road, cross over the Sheepstor Brook and walk up to Sheepstor Church where the Village Cross can be seen outside the church gate. The Sheepstor Churchyard Cross can be found by passing through the gate, walking up to the main door of the church and turning right. The cross is at the end of this path and serves as a support to the stile and an apse for the gate over the stile. There is an interesting skull and crossbones relief set in the gable above the church door. From the point where you approached the Church, turn left along the road, followed by the next right. This will take you past a wooden bungalow, with a rusty corrugated iron roof, called ‘Byeways’. You will soon reach a bend, where water rushes out of the field on your right and runs under what looks to be a blocked-up stile at the side of the road. Here, take the unmarked footpath to your right and through the gate at the top onto the open moor. Take the path to your left and follow it around keeping the wall on your left. When the wall bends away sharply to the left, continue straight on in the same direction. Keep with this track through a gateway, followed by a short section of trees and out into the open again. 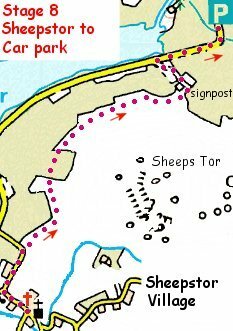 You can now enjoy the delights of the vast bulk of Sheepstor to your right, Down Tor directly ahead, the pointed shape of Leather Tor to your left and with Sharpitor to the left of that again. The peaceful waters of the Reservoir are also to your left, down in the valley. Continue on this path, which will eventually lead you down to a three way signpost. Turn left here, through a gate and follow the sign marked ‘Public Bridleway to Burrator Reservoir’. Turn right onto the road, cross the little granite bridge over the Narrator Brook and shortly you will find yourself back at the start. SAMPFORD SPINEY VILLAGE This is a very rural and quiet village. The cross appears to be sited on the front lawn of a house named: ‘The Old National School’. There is a little stream that runs across the green just below the cross. On the far side of the green is a farm with a very fine archway leading up to the front of the farmhouse. There are also various items of farm machinery left on the green outside the farm gate. MEAVY VILLAGE GREEN The village green is an elongated triangular shape, with a border of granite pillars. The Meavy Oak is at the pointed end of the green. It is a really old tree and the centre of the trunk is hollow. The tree gets its sustenance from three separate strands of trunk around its perimeter. One of the main branches now has to be supported by a long metal pole. There is also a war memorial placed on the green beneath another oak tree. The green is flanked by the Parish Hall on the one long side and by the Royal Oak Inn on the other. The third, shorter, side is bordered by some private houses. LOWER LOWERY FARM The massive building is still standing to roof level and the stone-work is in good condition. The building has an annexe built on to the right hand end. There are two open doorways along the main length of the building and a further four doorways have been walled up. In the annexe two windows have been blocked up and you can clearly see the holes in the walls that supported the beams for the upper floor. In the main building, at first floor level, there is a wide double doorway in the back wall. 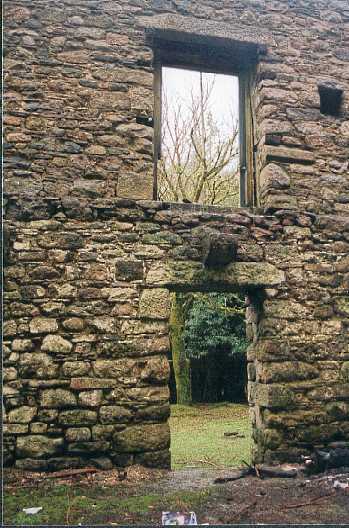 There are also a number of stones projecting inwards from the walls, one of which can be seen above the doorway in this photograph. These are flat on the top and rounded underneath and would have supported the beams for the upper floor. There are two windows at ground floor level in the back of the building that have been blocked up. One is of conventional size but the other is a mere slit on the outside, which gets wider as it comes through the wall into the building.